Last week learning and fun collided during marine biology residential camp!! Everyone had a blast whether it was wading through tidepools to find strange invertebrates (leopard dorid anyone...stalked medusa?) or preparing a skit during dorm time. I know there were many favorite moments and couldn't begin to name them all. For the counselors and instructors the best part of camp was meeting all the awesome campers and nurturing their interest in marine biology. Stay tuned for our Coastal Exploreres camp next week. Click here to view photos of summer residential camp on our Flickr site! 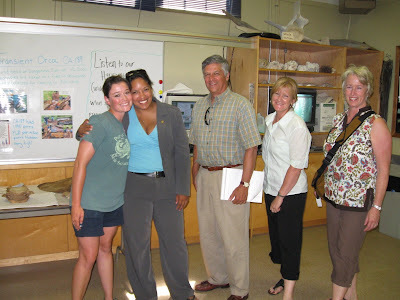 Today PTMSC had the honor of showing Kristine Reeves, aid to Senator Patty Murray, around our Marine Exhibit. Reeves visited Fort Worden and the Marine Science Center to get an insiders look at the exciting programs & future plans in place that make Fort Worden State Park an exceptional learning center for people of all ages. Reeves was interested in hearing about our hydrophone project, our Orca project and our various Citizen Science Projects. We exchanged a secret handshake when she was told I'm an AmeriCorps member here at PTMSC. From left to right: Allison Gravis- AmeriCorps member, Kristine Reeves- aid to Senator Patty Murray, Fred Romero- WA State Parks, Kate Burke- Fort Worden State Park manager and Anne Murphy- Executive Director of PTMSC. According to Tim Carpenter, Curator of Fish and Invertebrates at the Seattle Aquarium, octopuses can hold sperm for up to one year. 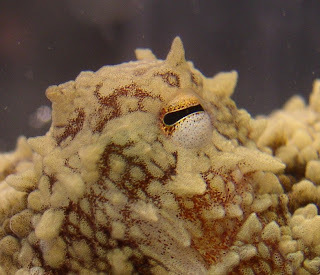 Additionally, octopuses can hold fertilized eggs for a couple of months before finding a suitable den to lay in. 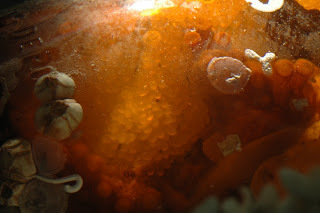 The gestation period for these eggs, providing that they are fertile, will be around 6 months depending on various conditions such as water temperature and flow. Now we will play the waiting game... Department of Fish and Wildlife gave Ruby to us back in late March. Trying to figure out how old the eggs are, whether they were fertilized before or after her new life in our jewel tank, while also factoring in the the water conditions seems seems like a math problem from a bad dream. For now we will do our best to provide Ruby with adequate water flows and little disturbance. Don't worry, we will keep you posted with the latest on Ruby and her offspring! Maybe we should call her the Octo-mom rather than wasting such names on C-rate Hollywood celebs. During the summer months, it's possible that you may happen upon a seal pup while walking on the beach. Seal pups regularly haul out for several hours a day to sleep, regulate their body temperature, and socialize. Young pups don't know how to protect themselves and are extremely vulnerable. It is completely natural for these seals to haul out, and we need to remember a few key points to Share the Shore with these fascinating creatures. Keep your distance. Staying at least 100 yards away is best. If you want to see the animals close up, use binoculars or a spotting scope. Do not touch a seal pup. These pups are resting and warming up and need to be left alone. The mother seal will not return to her pup while people are near. Keep pets away, and on a leash. Dogs can be quite interested in their surroundings, but an aggressive older seal could bite a curious dog. Also, some seals carry diseases that can be transferred to dogs and humans. Alert your neighbors. If you see a seal pup on the shore, inform your neighbors and remind them to keep dogs away. Call your local Marine Mammal Stranding Network. If a seal pup has been left alone for 48 hours or appears injured, call (360) 385-5582, extension 103 for any marine mammal stranded in East Jefferson County. For other areas, please click here. For more information on what you can do to Share the Shore, click here for information (PDF) from NOAA and the Washington Department of Fish and Wildlife. 5. The chaos that ensued at the bunkers during the 15 minute exploration time. 4. Sitting on the buoys during lunch time. 3. Using the huge seine net to catch fish in the eel grass beds. Keep in mind this list may vary from person to person. Click here to check out more of our camp photos on our new flickr site! Want to learn about other camps PTMSC is offering this summer? Have you ever seen a puffin? The Port Townsend Marine Science Center and Puget Sound Express offer Puffin Cruises every Saturday from now until August 8th. From PTMSC.org: Protection Island, at the mouth of Discovery Bay, is a very special; place in the summer. Dry, brown and lonely, it looks like a most inhospitable place. But it is alive with thousands of nesting birds - rhinocerous auklets, glaucous-winged gulls, pigeon guillemots, double-crested and pelagic cormorants, black oystercatchers, and even a few pairs of tufted puffins. It is for a glimpse of the elusive tufted puffin that many visitors make the trip. As every birder knows, no guarantee can be made that they will be sighted on every outing, but chances are very good that they will be spotted especially on the south side of the island. Like rhinocerous auklets, for which Protection Island is the major nesting site, the puffin use burrows in the cliffs and uplands to raise one or sometimes two chicks. The chance to see them carrying many small fish at one time in their bills, or even swimming, flying, or diving, is exciting. may be arranged. Proceeds go to support educational programs at the Port Townsend Marine Science Center. What do you get when you combine an orca skeleton and a team of dedicated volunteers? At PTMSC we have combined the two to form the Orca Project. The current goal of this citizen science project is to measure and photograph the bones of a deceased transient orca. Once all the bones are measured and photographed, we plan to put it all together in a reference guide called the Orca Bone Atlas. Jennifer Jackson, of the Peninsula Daily News, stopped by last week to check out the Orca Project and wrote up an article about what we are doing. Check out the online article here, or pick up the paper from Monday, July 6th to read the full article with pictures. Want to see what it takes to measure and photograph orca bones? Stop on by the Natural History Exhibit from 10 am to 3 pm on July 13th, 15th, 16th, or 17th and we can walk you through it. Our volunteers, like Katherine and Debbie in the picture above, will be working on the project all week. Admission to this special "living" exhibit is included with your admission to the Port Townsend Marine Science Center which includes both Natural History and Marine Exhibits.